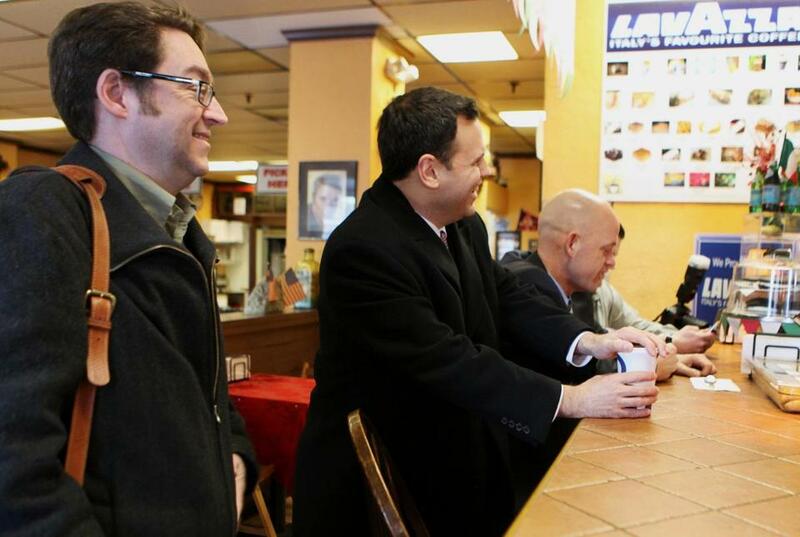 Customers showed up at the cash mob at The Cannoli Guy Café in Malden on Friday. Mayor Gary Christenson (middle) was among those offering support. Customers found out about the event, organized by the city of Malden, days earlier on Facebook and Twitter, and they came out to support the six-month-old cafe. That’s the spirit of the so-called cash mob that combines the buy-local movement with the power of a flash mob: getting strangers together on short notice to make a statement. In this case, the goal is to infuse small businesses at a prescribed time with cash, credit, and community. There have been several cash mobs in the region from Boston to Newburyport. And while it’s hard to know how many have been held globally, more than 200 organizers have surfaced since last fall, according to Andrew Samtoy, a Cleveland lawyer who popularized the concept. A thrift store in Cambridge in February was the site of one of the region’s first cash mobs. They have been met with varying degrees of success - some involving one store, others a row of merchants - but momentum is starting to build with more being planned in Lowell and Malden. “We are always thinking about new ways to invigorate the city. This is the most feasible and we can pull it off with limited resources,’’ said Ron Cochran, director of online services and communication technology for the City of Malden. Merchants do not run them, but are selected for a “hit.’’ Participants are encouraged to spend $10 to $20. There often aren’t any discounts or incentives - it’s less about nabbing a Black Friday bargain and more about sharing the wealth. Last weekend, stores in Brookline along a stretch of Beacon Street hampered by construction were selected for the city’s first cash mob. Around 30 to 50 customers visited a bakery, tavern, and hardware store, among other spots, for a few hours. To capitalize on increased foot traffic, Aaron Mehta, owner of The Wine Press, held a tasting and said sales increased 10 to 15 percent compared with a normal Saturday. “When things like this happen, it’s really up to the business owners to make it a success,’’ said Mehta, who has lost up to 20 percent in sales during a sewer project that closed traffic lanes and obstructed parking outside his shop. In many cases, civic or municipal groups initiate cash mobs, but they are more grassroots than government-run events. 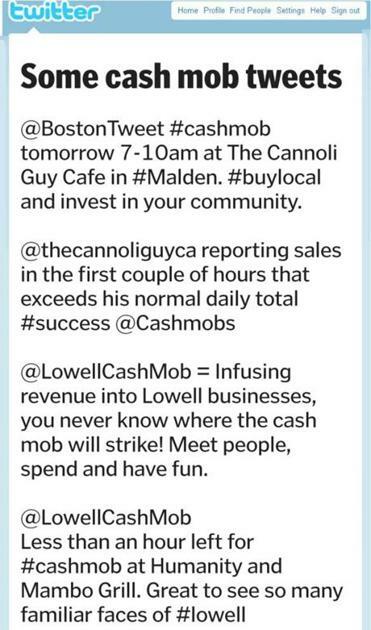 That was true in Lowell, where a cash mob struck taqueria Mambo Grill and boutique Humanity, 24 hours after being announced on Twitter. The 15 to 20 percent spike in sales was less significant than the “strong sense that the community was supporting you through the effort. It was a great blessing,’’ said Franky Descoteaux, who owns both businesses. Whether cash mobs can help merchants thrive remains to be seen. “It’s a challenge as a business model,’’ said Jeff Howe, an assistant professor at Northeastern University, who coined the term crowdsourcing, or tapping a network of people to solve a problem. Samtoy, who ran the first Cleveland Cash Mob at a bookstore in November, dreamed up the concept after visiting London shortly after the riots last year. He wanted to harness the energy of a crowd for good will, not ill.
Kathleen Pierce can be reached at kmdpierce@gmail.com.